Frugal and Thankful: My first ever burlap wreath. My first ever burlap wreath. Last year I painted our boring black front door bright turquoise, and it was love in first sight... 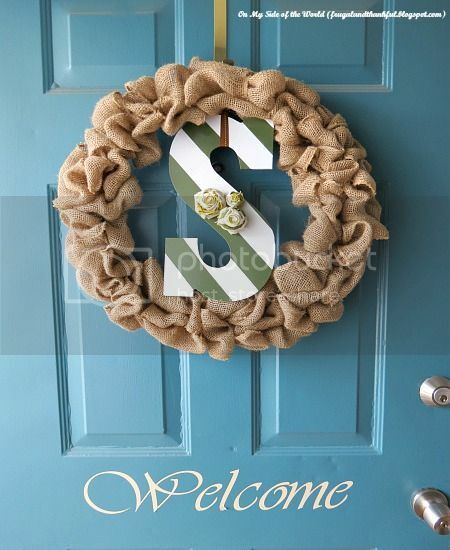 But ever since I did it, I wanted to make one of those cute burlap wreaths that you see all over the web. So I only needed to buy three things - a 10 ft roll of burlap (got it from Michaels for about $5 after 40% coupon), a metal form (ab. $3.50) and a big MDF letter that came from Hobby Lobby (on sale for only $1.50). All the rest of the stuff I needed, I already had on hand. I then used some leftover spray paint in forest green. While the paint was drying, I made the actual wreath. I'm not going to post a tutorial because, honestly, there are hundreds of them online, and it really is a 15-minute project, very easy to make. Two warnings though: first, is that 10 feet of burlap was BARELY enough to cover the form. Next time I would get some extra just in case. Second is that if you have allergies, especially to dust, be sure to borrow a heavy-duty gas mask from somebody (dead-serious here!) because the burlap lint stuff will be EVERYWHERE and you are guaranteed to sneeze for the rest of the day. It's not my first time to work with burlap (I even made the stockings out of it) but it was for sure the messiest. I think, from the beginning to the end, it only took me about an hour (minus the drying of the paint). Wow! 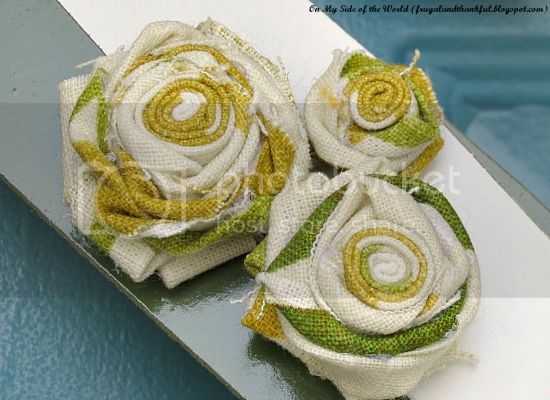 Its amazingly simple to make, but its lovely on your front door. It does add a welcoming touch to the door - which colour I love! 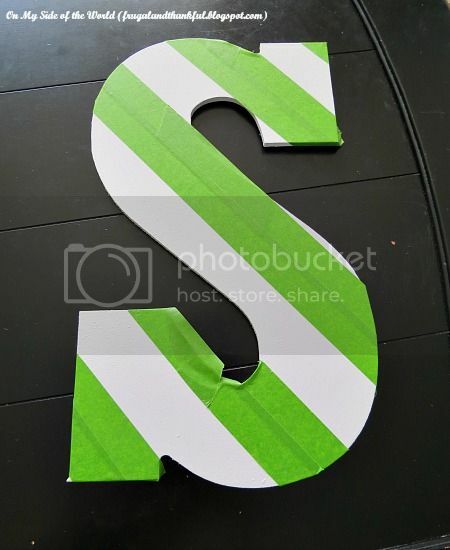 I love the burlap ruffles and the striped "S" is stunning. An impressive project especially if it only took an hour. Do you think all of that will hold up well in the weather? Nice, Lena! I love burlap! I really like the color of your front door too- so cheerful! Great job on the wreath project! Very pretty!! You did a great job!! I've ordered some burlap for a project - a wreath being one of them ! Super! I love it! Very professional looking. Are you taking orders?? Very cute. You sure make it look easy, even to design-challenged people like myself! Love it. Awesome - I am feeling tempted. I might have just discovered my new back door wreath. 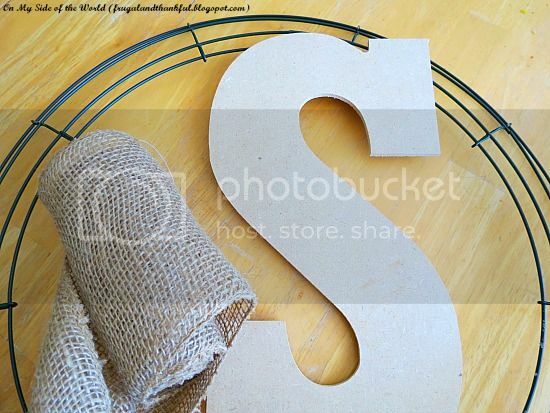 I have burlap (two 10 ft rolls) the form and an initial that's already been painted...Thank you so much for sharing! That is super cute! I'm going to dry this. So easy too. Beautiful! Great way to welcome spring! What a gorgeous wreath-what a welcoming way to welcome your visitors. You are very clever! If you have a minute to spare I'd be thrilled if you could link up your post to my weekly Say G'Day Saturday party. It has just started and this would be a great addition. 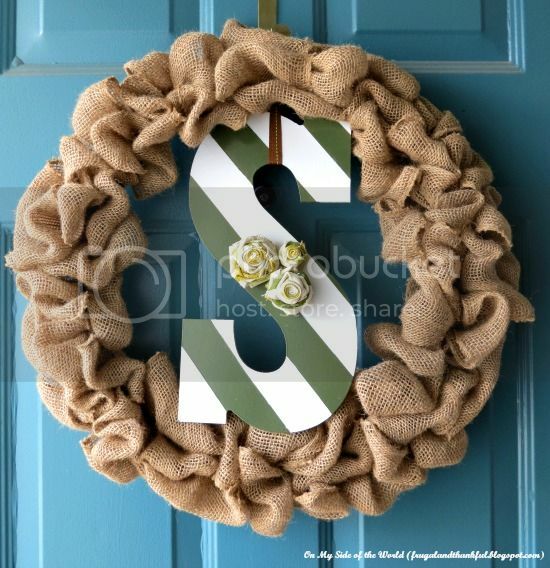 Love burlap wreaths! So cute! very beautiful!! all the colors and materials work so perfectly! thank you lena for inspiring!